As near as I can tell, it all began with Dashiell Hammett. I suppose many things did and still do, but I'm referring specifically to the pairing of a color name with the noun "harvest" for the purposes of a title to something. 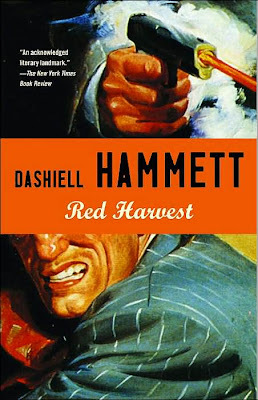 In 1925, Hammett published his novel Red Harvest, which, I note with amusement in light of the theme of this article, was based on his experience as a Pinkerton agent. Aside from also inspiring the name of a Norwegian industrial metal band, some claim Red Harvest provided inspiration for Akira Kurosawa's Yojimbo. Also, a line from the book inspired the title of the Coen Brothers' Blood Simple. Less directly — possibly not at all, really — Red Harvest would seem to have also inspired Blue Harvest, which was the working title of Star Wars: Return of the Jedi, used during the shooting of principal photography to allay the already ravenous legion of Star Wars nuts from stalking the cast and crew during shoots. A purported horror movie, Blue Harvest bore the tagline "Horror beyond imagination." According to the Wikipedia entry, the Blue Harvest logo initially appeared anywhere a film's title should: shirts, caps, coats, buttons, signs, invoices and stationery. The words appeared in the famous Star Wars font, however, so maybe they acknowledged that they weren't fooling anyone. It is still used for a Star Wars fan site. But that unused tagline seems funny to me now, given how colossally terrible Family Guy's Star Wars parody was. (Thirtieth anniversary of the source material or not, it ended up coming off as just thirty years too late. To reinforce the datedness, it actually features a one-line cameo by Helen Reddy. Bleh.) What I found lame, scores of people seemed to love, however. This episode two was titled "Blue Harvest." "Purple harvest" seems to be a popular word pair when writing about wine, I gather, based on its use in this Time magazine article, this book about Napa, and this photo of grapes. But I suppose this one makes sense. "Green harvest" is a no-brainer. It's used for everything from seed companies to superfood shakes. Orange harvest even more so. Another band is called Black Harvest. They look scary. There's some reference for Pink Harvest, as the title of a autobiographical book by author Toni Mirosevich. I'm not sure why it's called this, but the Amazon.com description seems to imply that the author and protagonist is a lesbian and her family resides in the former Soviet Union. The Ash-Gray Harvest Spider probably doesn't work, either, but it was referenced in an American Naturalist article by the famed Clarence M. Weed. there's another hit for Brown Harvest on a vaguely familiar-looking website titled Award Annals. ADDITIONAL EDIT: Okay, so apparent the blog called Yellow Harvest is actually Star Wars-related and not "Star Wars-themed but not really Star Wars-related," as I originally said. According to its debut post, Yellow Harvest the Blog is dedicated to Yellow Harvest, a "Force-Cast BF2 Mod." I haven't the slightest idea what that actually means or if any of that capitalization is necessary. If the Force-savvy could clarify, I'd be endlessly appreciative. I disagree! I run that site and we are very Star Wars-related. What you're missing here is that the site is for a Battlefront II mod based on the number-one Star Wars podcast on the net, The Weekly Force-Cast. So I see. It has been ammended. The Force-Cast (http://www.theforce.net/podcast) is the official podcast of TFN and Rebelscum. They release weekly episodes dedicated to all things Star Wars. Several fans of their show (including myself) have decided to create a Battlefront II mod based on the personalities and in-jokes from the show.